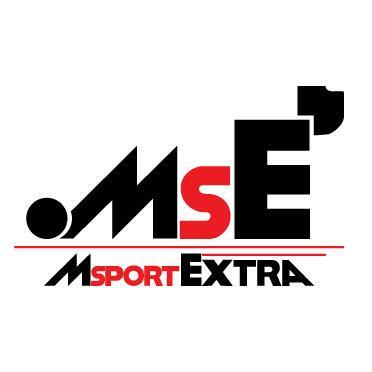 However, assuming that each team has started off at the first test with what they believe to be the best solution to the current regulations, who has done what and why? What are they trying to achieve with their design? And where can we expect nose design to go next? Hopefully this piece should give you the answers to these questions. By far the most popular concept for 2014, the “finger” nose has many benefits with only a few drawbacks to deter the common engineer away from such a solution. For the aerodynamicists, this one (coupled with the “tusk” solution which we will discuss later, is a real winner. 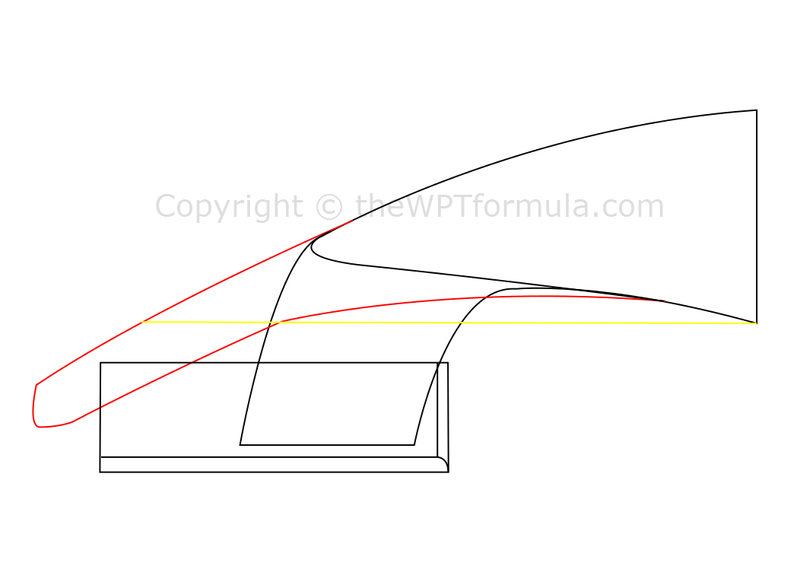 As discussed in my pre-season piece on front wing design last year, the minimum area of the cross section of the crash structure behind the most forward 50mm of the nose (tip) is 9000mm2. In simplistic terms, teams can either make the structure roughly the same size as a 53mm radius circle or various forms of rectangular shape. The rules then stipulate that this crash structure must then extend upwards to a the point that marks the base of the chassis – 250mm above the reference plane. Any sort of structure can be formed beyond this point to the top of front bulkhead (525mm), hence the variety of shapes we are seeing. To start with, I have examined the Force India VJM07 solution. The feature that strikes you most about its design is just how long the protruding appendage, attached to the upper “wedge” shape, is. The cross section is most likely to be the smallest area required by the regulations (9000mm2) and takes on the form of a rounded square. It smoothly forms with upper wedge shape at the top of the appendage, but the bottom of the thin structure continues to run along the bottom of the nose before eventually forming one continuous surface just before the front bulkhead. This nose design demonstrates how continuing to utilise the mandatory crash structure beyond its intended “end line” of 250mm (as shown by the yellow line below) can open up a lot of space for airflow to pass under the chassis. Aerodynamically, the Force India solution is arguably the best interpretation of the rules. The appendage (red) on the Force India is extended beyond the legal requirements, although this is totally within the rules. Only the section of the appendage below the yellow line is actually needed. Attaching the “finger” at a higher point on the wedge effectively recreates the high noses we have seen in previous seasons with minimal blockage. However the main stumbling block with this design is passing crash tests. Having a long, thin structure taking the initial impact before the upper wedge starts to absorb more energy must require a lot more engineering to succeed. As a result the appendage on the VJM07 is likely to be a lot heavier than its rivals, and this mass is not exactly low to the ground. At the other end of the spectrum we have the likes of Ferrari and Mercedes who have stepped away from the common solution at the moment. 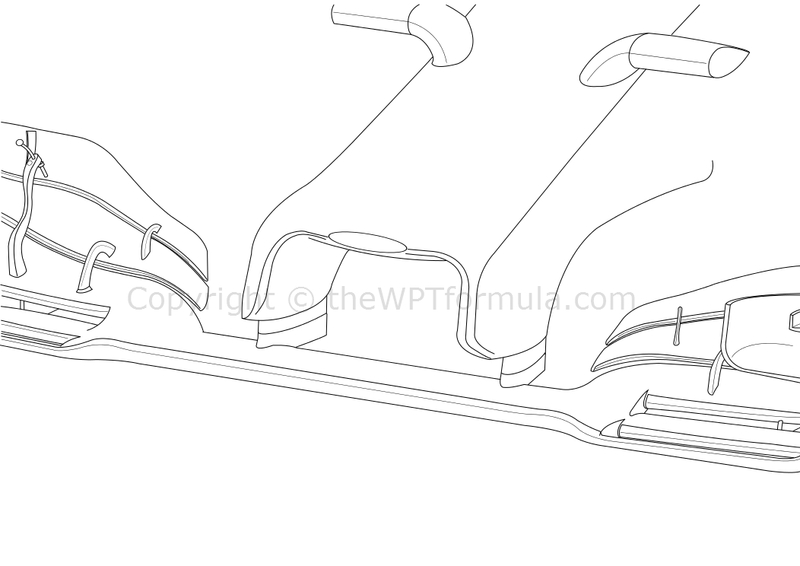 Although the W05’s design is slightly more complex than the F14 T’s, the same basic principles apply to both concepts. Both noses concentrate on creating a venturi effect between the two connecting pylons, reducing pressure beneath the nose and thus creating more front downforce. 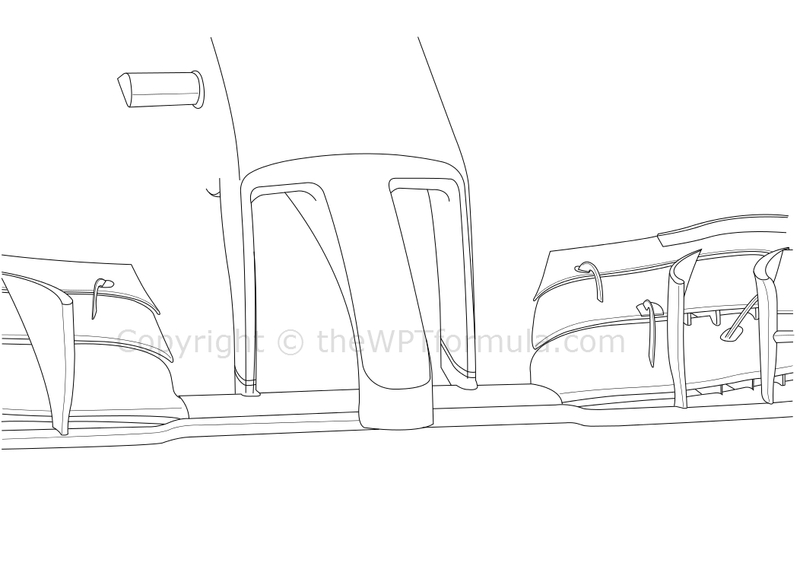 Rather than opting for the smallest cross section possible (like the “finger” option), the “letterbox” idea follows along the lines of what the FIA perhaps intended to produce when writing the technical regulations. One, wide profile is formed all the way up to the front bulkhead line, with no drastic changes in cross section evident along the way. Although front downforce is significantly increased, rear downforce is at a loss with this layout. This is completely the opposite of what the “finger” nose is trying to achieve as this solution allows a lot more airflow to pass around the protruding appendage, beneath the chassis and into the area around the leading edge of the floor. 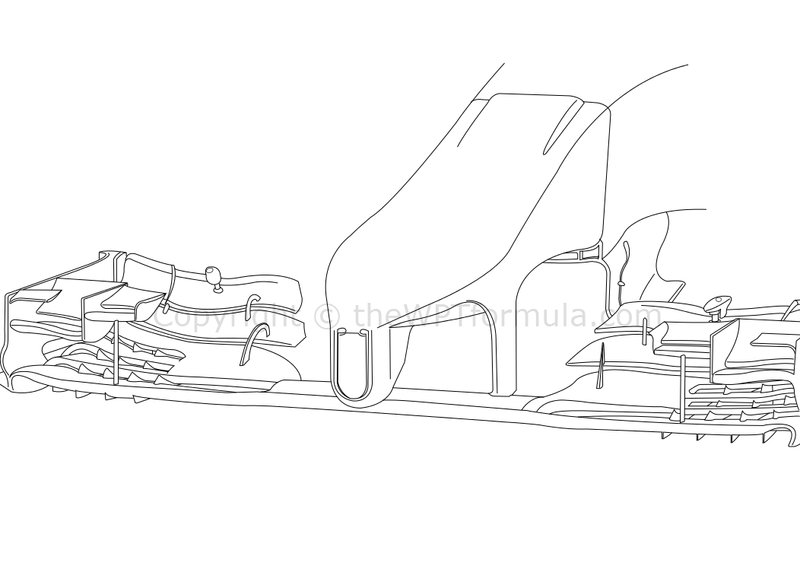 The “letterbox” reduces the volume of air passing into this region dramatically, although both Ferrari and Mercedes have found ways of bypassing this disadvantage to a certain extent. Ferrari have profiled the nose in such a way that air can spill around the sides of the nose to reach the space below the chassis. Flow-Visualisation (Flo-Viz) paint used during the Jerez test proved this to be the case, the process being aided by the dog-leg mounted camera pods (placed in a similar position to where Mercedes have placed them). Mercedes on the other hand have managed to raise the height of the nose using a clever interpretation of the expression “nose tip”, which you can find out about on my analysis of the W05 when it was launched. Only two teams have followed this path this year: Red Bull and Marussia. Both teams use a larger rectangular cross section to conform to the regulations, although its positioning and shaping after the tip of the nose itself cleverly avoids the large appendages seen on other cars whilst retaining a high nose height (overall). The “keel” makes up the cross sectional area requirements. Because the top of the “keel” is already in line with the required 250mm height, its length can be designed with relative freedom. As a result of this design, only a small portion of the “keel” needs to be at least 9000mm2 therefore the remaining area can be developed to suit the car’s needs. This design freedom is demonstrated in both the Red Bull and Marussia versions of this concept. Suspended from the main body of the nose, the cross section is tear-dropped towards its trailing edge which allows the airflow passing beneath the make its way inwards towards the centre of the car. The main advantage of this design is that it is the perfect compromise between airflow management and weight. This is where the “finger” nose falls down: as it has to take the initial impact a crash event, it must have more structural integrity than both the “letterbox” and “keel” solutions. This adds weight to the front of the car and compromises have to be made elsewhere as a result. Because the “keel” is already attached to the main body of the nose, the suspended cross section will be extremely light as a result. However the design does have one drawback: blockage. The larger rectangular area present to the oncoming airflow isn’t ideal aerodynamically. Red Bull have attempted to address this issue by bleeding off high pressure air built up on the tip of the nose via a ‘u’ shaped slot. This is without doubt the most ridiculous solution of them all. So far only Lotus have fully explored this path, although numerous teams are said to be running it in CFD and perhaps in the windtunnel. The regulations stipulate that the crash structure must be comprised of one single cross section of a minimum area (as discussed above) with a 50mm nose “tip” to form the front of the structure. There is no regulation that covers the positioning of the crash structure relative to the centreline of the car other than it has to be within line of the sides of the chassis. Lotus have, legally, conformed to these rules: the “tusk” closest to you in the image above meets the regulations perfectly. So what’s the left, far “tusk” doing? Lotus have interpreted the way the rules are written very cleverly indeed, for the far “tusk” is, technically, not part of the crash structure and therefore not part of the regulations that covers this area of the car. This is because the far cross section is offset rearwards by over 50mm from the other “tusk”. When viewed from the side only one “tusk” fits the regulations, therefore it is legal. The other is therefore disregarded and it is eliminated from the definition of a “frontal crash structure” in the regulations. If both “tusks” were in line there would be two crash structures, which would be illegal. Hopefully that made sense… Apologies for any confusion. The main objective of this layout is to ram as much air beneath the chassis as possible to create rear downforce. The gap between the “tusks” allows this to occur and this solution has been recognised by many senior designers as an intriguing concept to explore before the season opener in March. There are, however, two large pitfalls for this nose. Having two structures extending outwards increases weight by some margin. This weight penalty has been further emphasised by the fact that Lotus experienced initial struggles in passing the crash tests, so even more weight needed to be added. Moreover, there have been claims that the design is at fault when the car is turning (or in yaw). The two appendages could create a lot of disturbance at the front of the car and create a handling deficit in the form of understeer. 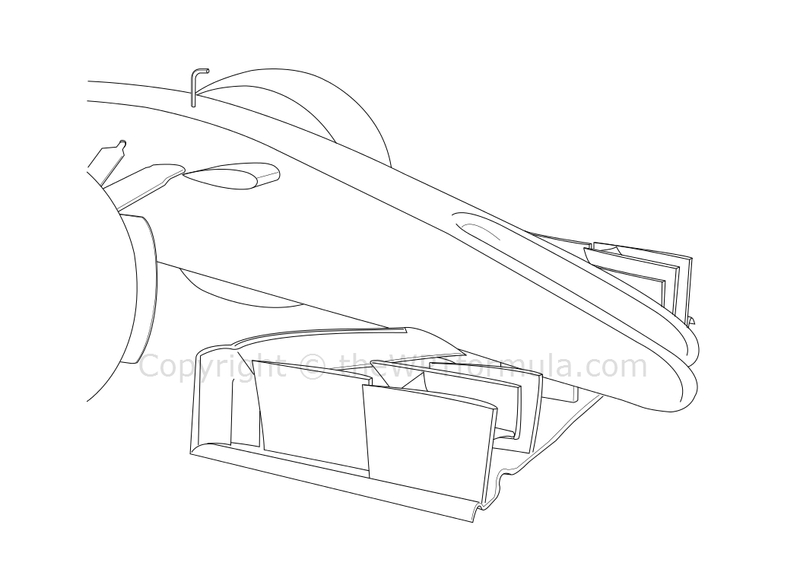 The fact that one “tusk” is offset relative to the other should not make a drastic difference, however, although there will be small disturbances to the airflow passing around the chassis area and therefore around the front of the sidepods.